Harry Kane scored 79 seconds into his England debut and Wayne Rooney moved a step closer to Sir Bobby Charlton’s all-time goal scoring record in a routine Euro 2016 dismissal of Lithuania at Wembley. Kane – with 29 goals for Tottenham this season – emerged as a substitute after 70 minutes with England already on the way to a fifth win from five qualifiers with goals from Rooney, Danny Welbeck and Raheem Sterling. The stage was set for the 21-year-old but even the man with the Midas touch in front of goal this season would have struggled to believe he would score with his third touch as a full England international, heading in Sterling’s cross at the far post. It was the final flourish on an England win that was little more than a formality in a group that surely provides the safest of passages to France next summer. Manchester United moved to within just two points of second-placed Manchester City thanks to a commanding 3-0 Premier League victory against Tottenham. United needed just nine minutes to break the deadlock at Old Trafford as Marouane Fellaini picked out the bottom corner after being played in by Michael Carrick. Carrick soon turned from provider to goal scorer, doubling his side’s lead with a well-taken header after Tottenham had failed to deal with a corner. And Wayne Rooney made it three inside 34 minutes, capitalising on some poor Spurs defending as he raced clear of two opponents and then slotted past Hugo Lloris. His celebration — pretending to box before falling to the ground — made reference to footage that was unearthed showing the forward appearing to be knocked unconscious by Stoke City full-back Phil Bardsley. Tottenham failed to recover from their first-half display and were unable to pull a goal back after the break as United held on comfortably for the win. Danny Welbeck came back to haunt Louis van Gaal as the Manchester United manager was subjected to a night of despair and defeat at Old Trafford. Capitalising on a horror backpass from Phil Jones, Welbeck sent Arsenal through to the semifinals of the FA Cup with a 61st-minute winner after Wayne Rooney had equalised Nacho Monreal’s opener. To pile yet more misery on the United boss, he watched Angel Di Maria get sent off towards the end of the 2-1 defeat for pulling referee Michael Oliver’s shirt as he reacted angrily to being booked for diving. 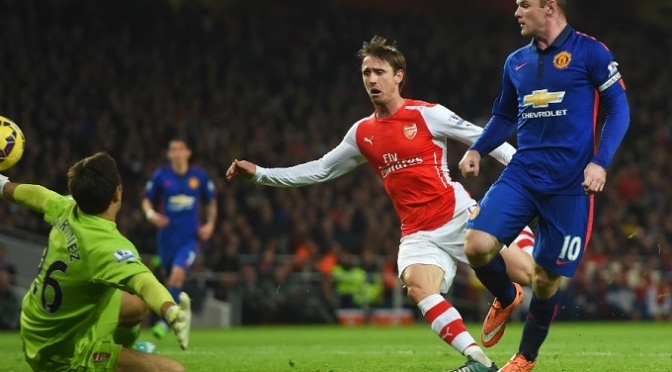 Replays showed Di Maria was pulled back by Aaron Ramsey before he tumbled to the ground, but the way in which he reacted will not please United boss Van Gaal. Di Maria can have little reason to complain. The £59.7m signing snatched at Oliver’s shirt as he turned away after issuing him with a booking. The dismissal is the latest episode in a long list of disappointments for the British record signing, who Van Gaal hoped would bring silverware to Old Trafford. 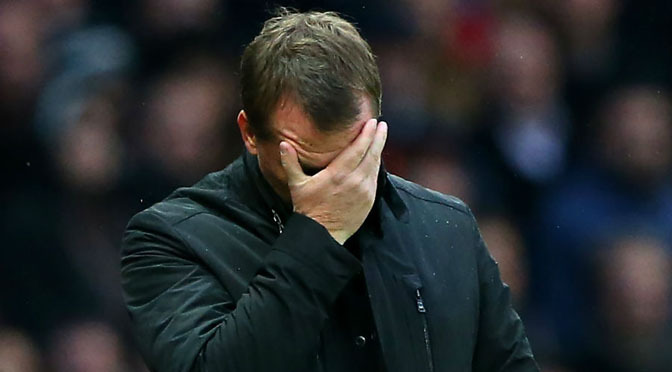 With United 10 points behind Chelsea in the league, that dream is almost certainly over. After a mildly encouraging performance in the first half, United wilted and looked blunt after the restart. Welbeck, the Longsight lad who left his boyhood club for north London last summer, provided the killer touch after a clanger from Antonio Valencia. Van Gaal claimed he controversially ditched Welbeck last summer because the striker did not score enough goals. And while the forward has hardly been prolific at Arsenal, he will have enjoyed showing Van Gaal what he is missing here. For Van Gaal, the dream of silverware may be over, but Arsene Wenger’s side are now very much favourites to regain the FA Cup after registering their first win at Old Trafford in nine years. Wayne Rooney’s penalty helped Manchester United beat Sunderland after the visitors’ Wes Brown was sent off in bizarre circumstances at Old Trafford. Rooney scored after a foul on Radamel Falcao, for which Brown was dismissed and not John O’Shea, despite protests from the visitors. 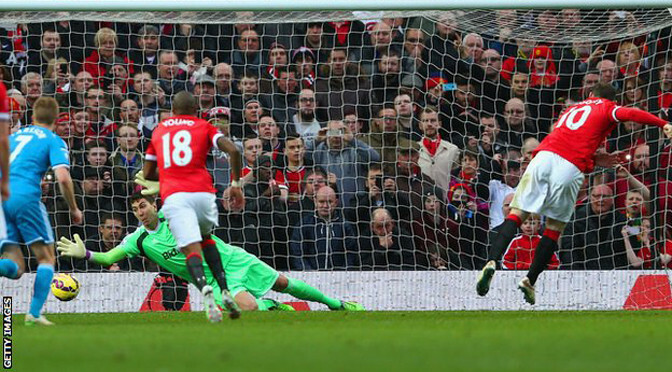 United added a second when Rooney headed in after Adnan Januzaj’s shot was parried into his path. 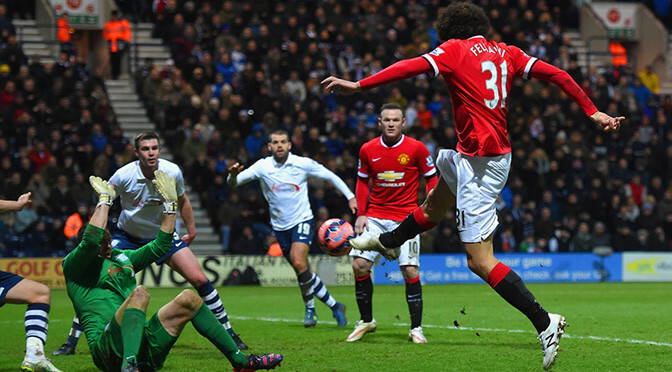 The victory reasserted the home side’s challenge for a top-four place. United moved up to third place in the Premier League as they claimed an 11th home win out of 14 in the top-flight so far this season. However, Brown’s red card emerged as the talking point as the Old Trafford side finally earned a breakthrough to go with their improved second half urgency. Falcao controlled an Ander Herrera cross beautifully in the box and, as he turned in between former United defenders Brown and O’Shea, looked to have been pulled by the latter. Referee Roger East red-carded Brown and, despite the official speaking to his assistants via his headset, his original decision stood. The fourth official for the game was Martin Atkinson, who was criticised for his refereeing when Chelsea drew with Burnley last week. After the match, the referees’ body in English football released a statement claiming East had seen contact from both O’Shea and Brown on Falcao. It added that East chose to dismiss Brown and not O’Shea because he thought the former had fouled Falcao while he was in the act of shooting. Coincidentally, East’s decision occurred on the same day as video technology trials during competitive matches were put back at least 12 months at a meeting of the game’s lawmakers. While there may be controversy over the sending off, there could be little argument over a result that leaves the Black Cats three points above the relegation zone. United dominated possession and were initially frustrated by the massed ranks of the visitors, who had gone close to taking an early lead when Connor Wickham’s shot was saved by David de Gea. The home crowd offered a sign of their frustration at their side’s failure to find a cutting edge in attack with a chorus of disapproval when a United corner ended up with a back-pass to De Gea. The home side almost gave the Old Trafford faithful the goal they craved when a Young shot across goal ricocheted off O’Shea and crossbar before Herrera headed wide from the rebound. A Marcos Rojo shot from a corner was cleared from the goalmouth by Sunderland midfielder Sebastian Larsson and, even though United had 71% of possession in the first half, they could not find a way through. The ineffective Angel Di Maria was replaced by the lively Januzaj at the break and he powered a shot wide as United began to exert a greater threat. But the penalty incident gave United the chance to score and Rooney, playing in a forward role, made no mistake as he avoided going nine league games without scoring for the first time since joining from Everton in 2004. The England striker added a second when he nodded in after Januzaj’s shot was parried by keeper Costel Pantilimon. An own goal from Kieran Gibbs and a Wayne Rooney strike gave Manchester United victory over Arsenal. Gibbs collided with goalkeeper Wojciech Szczesny before deflecting Antonio Valencia’s shot into his own goal. 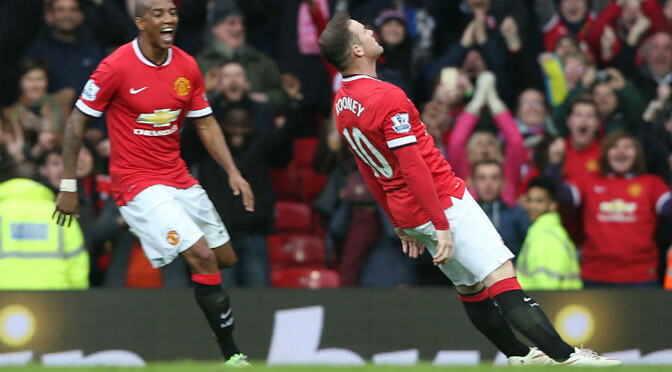 Rooney added a second with a chipped finish after Angel Di Maria led a United counter-attack. Olivier Giroud marked his comeback from a broken leg with a stunning left-foot strike in stoppage time but United held on to go fourth in the Premier League. Wayne Rooney silenced the ferocious home supporters inside Celtic Park as England eased to victory over Scotland in the Battle of Britain. Alex Oxlade-Chamberlain converted a superb deep cross from Jack Wilshere in the first half and Rooney scored his 45th England goal after the break to double the lead. Andrew Robertson pulled one back for Scotland in the dying minutes, but they could not add a second and Rooney found the net to seal the 3-1 victory over England’s bitter neighbours and rivals. England’s fans, vocal enough themselves, revelled in the victory, but they tainted their reputation by singing foul-mouthed provocative anti-IRA songs. The Football Association will be forced to act, particularly when England are due to play in Dublin next June. The main focus here should not be on the songs, though. England deserve huge praise for the way they coped with the intimidating white-hot atmosphere in east Glasgow. This was a real test for Roy Hodgson’s young squad and they passed it with flying colours. England laboured to victory over Estonia in Tallinn as Wayne Rooney’s late free-kick made it three wins out of three in their Euro 2016 qualifying campaign. 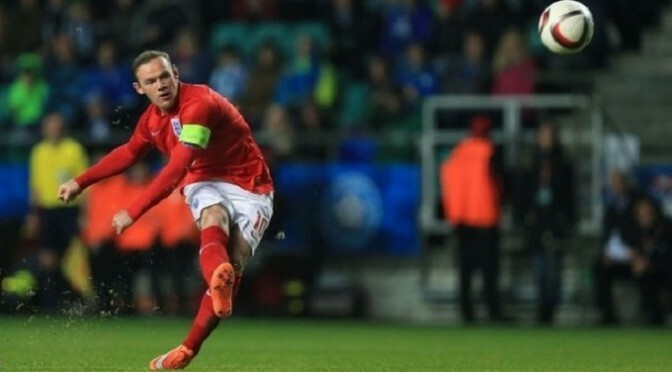 Rooney curled his shot in from just outside the area 17 minutes from the end of a mediocre encounter to give England’s captain his 43rd goal for his country – six behind all-time record holder Sir Bobby Charlton. It rescued England as they struggled to break down the stubborn Estonians, who stood firm even after captain Ragnar Klavan had been sent off for a second yellow card three minutes into the second half. And it spared manager Roy Hodgson some awkward questions over the omission of Raheem Sterling after Liverpool’s teenager admitted he was tired following the 5-0 win against San Marino at Wembley. England monopolised possession but the lack of end product was alarming against opponents who were dogged but hardly an upgrade into the European elite after the stroll against San Marino on Thursday. Rooney’s winner, a rare touch of class, also lifted his own performance after the 28-year-old struggled to apply his usual high standards. Indeed he was in danger of being replaced by Rickie Lambert just before his decisive contribution. The Manchester United captain had opportunities before and after his goal to move closer to history but his display was in keeping with England’s night – largely frustrating and salvaged only by a single moment. Hodgson used the diamond formation, as he had in the opening 2-0 win against Switzerland in Basel, but whereas there – with Sterling at its point – it looked effective, here it left England lacking in pace, creation and width. It was only when Arsenal’s Alex Oxlade-Chamberlain and the Liverpool youngster were introduced that England looked like getting behind the hosts. They can justifiably point to a job done, and nine points out of nine, but this largely uninspired fare did little to warm fans who turned out in plummeting temperatures in Tallinn. There should be few obstacles in England’s way on the route to Euro 2016 – the possibility of 10 wins remains a strong one – but it is to be hoped the level of excitement is greater than that witnessed here in a group not exactly sprinkled with stardust. After a minor scare in the opening seconds, England dominated the first period to such an extent that one point they enjoyed an 82% share of possession – the more telling statistic was that they did not muster a shot on target until the dying moments of the half. This had much to do with Rooney’s failure to accept chances, volleying over from Jack Wilshere’s pass and showing an uncharacteristic lack of control and sharpness in the area when given other opportunities. The visitors were looking for any advantage they could get and one arrived three minutes into the second half when Klavan departed after a cynical barge on Fabian Delph. Hodgson made two changes in quick succession just after the hour as Oxlade-Chamberlain and Sterling replaced Delph and Jordan Henderson. And Sterling was involved as England finally broke Estonia down after 73 minutes. He was fouled on the angle of the penalty area and Rooney weighed his options up carefully before curling in a low, right-foot effort from the set-piece.